As the 2014-15 school year unfolded at Prospect High near San Jose, CA and students settled into classrooms, behind the scenes, staff organized into focus groups. It was the year of the Western Association of School Accreditation (WASC) mid-cycle review, and our school needed to revise our vision and mission statements. The vision focus group had a powerhouse of members, but we knew creating a vision couldn’t be done with our input alone. We agreed that our community must participate. Staff had already contributed at the beginning of the year during a faculty meeting and we had a skeleton version of a vision statement. But how to get the parents and students’ input? At that time the Guidance department was in the midst of grade level class visits and parent night presentations. The class visits included computer lab time to work on Family Connection activities. I offered to create a quick survey in Naviance for students and parents to take. Other team members interviewed students at a pizza lunch about the school’s vision. Before the survey was administered to either parents or students, the stage had to be set. To help direct them, we presented “ Simon Sinek - The Golden Circle - TedTalks 2009”. The key takeaways from the TedTalk were included in the presentations, leading student and parents to focus on the “Why?” our school exists – The Vision. The survey developed for the students “What will Prospect look like in 2020?” was administered during the Guidance department class visits. Family Connection allowed the inclusion of all student populations in a manageable format. Students were responsive and eagerly provided their input. The results were invaluable to developing our vision and mission statements. Using Naviance to create a survey is secure plus student and parent information is already in Naviance and correlated to the survey results with detail. Responses are grouped by grade level, which provides meaningful visibility that can be used to develop future class visit agendas and grade level College & Career Center activities. Student feedback from the surveys and interviews along with feedback from the parent nights was presented to the Vision focus group. Several common themes emerged and this drove the inclusion of important, key areas into the vision and mission statements. 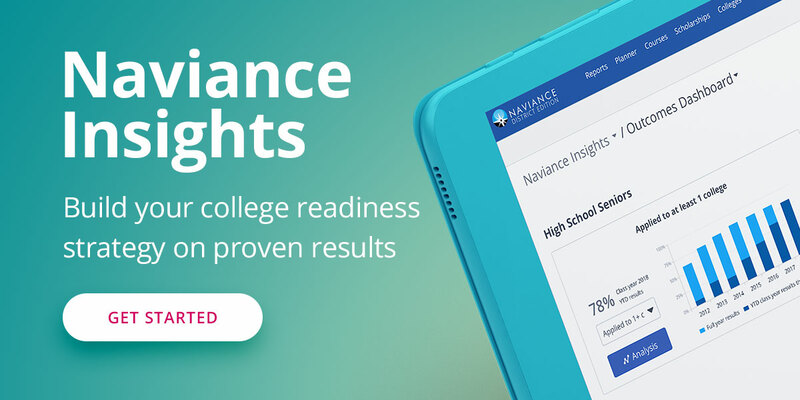 Naviance provides an immediately accessible, simple and visually appealing summary of results. I could check the results throughout the day and watch them grow and change. The summaries can be saved or printed, and the detailed survey responses exported to Excel. This allowed for additional uses of the data such as graphs and charts to be included in the WASC report. Over the course of three meetings, our Vision focus group had developed a new vision and mission statement that was presented in December at the monthly faculty meeting. Next semester, these statements will be shared with the students and parents. They will recognize that we valued their input provided in the surveys and incorporated it into developing their schools vision and mission. We’ve shared our student survey below, and the vision and mission statements we created as a result of the feedback. Learn how you can create a survey in Naviance or utilize surveys that other schools have created and shared. 1) What do you expect from your high school? 2) What do you expect from your teachers? 3) What is Prospect doing right? 4) Does Prospect prepare students to have a bright future? 5) Do you feel empowered and accepted by the Prospect community of students, teachers and staff? 6) What do you want to be prepared for when you leave Prospect? Reach her/his potential through a dynamic and engaging education. Attain skills and knowledge to be prepared for career and college. Be empowered to take an active role in his/her community. Be a part of a supportive campus culture that prepares her/him to be an active citizen in a global society. Prospect High School provides students with a challenging, dynamic education that offers them the opportunity to gain the skills needed to be prepared for success in career and college. We encourage empowerment by honoring student voice and diversity within a safe and supportive campus culture. We value and teach the importance of integrity, perseverance and empathy. We recognize that we are part of a greater community and a strong, active partnership strengthens all.